Zebra fish are the darlings of the fish world. These 2-inch fish thrive in a variety of water conditions in the wild, and they aren't picky in captivity, either. They make few demands beyond a comfortable tank and basic food. Zebra fish play well with others, but bigger fish might eat them. Do not keep you zebra fish alone. This fish needs at least five to seven same-species friends to keep from becoming withdrawn and antisocial; the larger the school the better. In small groups zebra fish are often timid, but they are typically active and friendly when comfortable in their environment. Territorialism may take place during breeding, the males chasing or biting each other. You can keep zebra fish with other species as long as they're not big enough to eat the zebras. 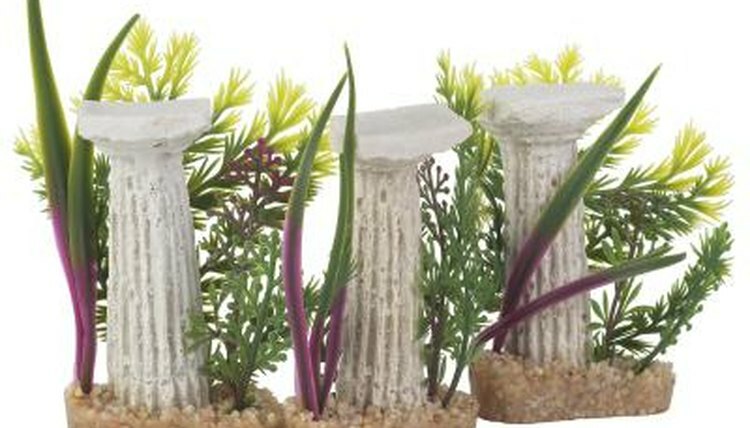 Provide an aquarium of no less than 10 gallons' capacity. That's large enough to hold up to a dozen zebra fish. Use a fliter to keep the water clean and high in oxygen. The temperature should range between 65 to 77 degrees Fahrenheit . The water should be free of chlorine and have a pH of 5.0 to 7.0, neutral to alkaline. Spread large gravel or two layers of marbles around the bottom of the tank; the latter is beneficial if you plan to breed your zebra fish, although a separate tank is recommended. Provide pockets of vegetation along the bottom, such as in the corners, with large open areas for swimming. Wash the tank as needed, avoiding detergent. Zebra fish will eat anything smaller than themselves -- including their offspring -- either in the tank on the surface. Sprinkle a small amount of tetra flake food on the surface of the water twice each day. Between feedings, give your zebra fish a rinsed brine shrimp. Small pieces of fresh vegetables are also well-received. Zebra fish scatter their eggs and forget about them, unless they can see them -- then they are food. Zebra fish are independent and they're prolific breeders; they can breed year-round but may stick to doing so in the summer when daylight lasts longer. Move pregnant females to a separate breeding tank, then add the male within 24 hours; remove the adults once the eggs are deposited. Or move all of your zebra fish to a second tank if you see evidence of eggs or small fry in the first tank, to avoid cannibalism.